The Wahls Protocol has become a sensation, transforming the lives of people who suffer from autoimmune disorders. Now, in her highly anticipated follow-up, Dr. Wahls is sharing the essential Paleo-inspired recipes her readers need to reduce and often eliminate their chronic pain, fatigue, brain fog, and other symptoms related to autoimmune problems, neurological diseases, and other chronic conditions, even when physicians have been unable to make a specific diagnosis. Packed with easy-to-prepare meals based on Dr. Wahls’s pioneering therapeutic lifestyle clinic and her clinical research, in a simple format readers can customize to their own needs and preferences, this cookbook features breakfasts, smoothies, skillet meals, soups, wraps, salads, and snacks that are inexpensive to prepare, nourishing, and delicious. With strategies for cooking on a budget, reducing food waste, celebrating the holidays without compromising health, and helpful tips from fellow Wahls Warriors, The Wahls Protocol Cooking for Life will empower readers to make lasting changes and finally reclaim their health. Terry L. Wahls, M.D., is a clinical professor of medicine at the University of Iowa Carver College of Medicine in Iowa City. She conducts clinical research studying the use of diet and lifestyle interventions in autoimmune and other chronic disease states. Her current clinical trial featuring the Wahls Paleo Diet received the support of the National Multiple Sclerosis Society. She has made it her mission to spread the word about The Wahls Protocol through her TEDx talk; her website, terrywahls.com; the Wahls Foundation; and Wahls Protocol Seminars. Dr. Wahls lives in Iowa City, Iowa, with her wife. "Our food choices are nothing short of pivotal as it relates to our health, and Dr. Wahls has done a masterful job leveraging the very best of nutritional science to create a breathtaking array of recipes that cover all the bases in terms of personal preference. The Wahls Protocol Cooking for Life deliciously helps you to re-write your health destiny, for the better!" 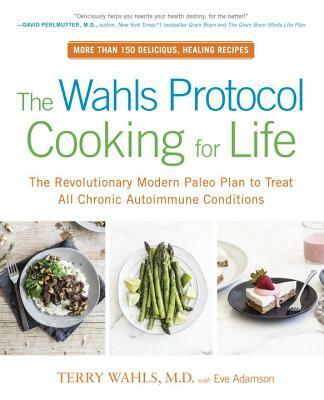 "Based on Dr. Wahls' pioneering research, this empowering, easy-to-use cookbook will transform the health of anyone suffering from autoimmune disease."